It's is GSS in Singapore & I have been really obedient! I tried to stay home but we (the chua family) went shopping on Monday! Boy, the sales was crazy. Especially in Zara, everything was discounted by at least $30 & mind you they were THIS season's stuff! MAD RIGHT?! My floral jacket, neon blazer were all sooo much cheaper & they have my sizes :( sad face! But I managed to get hold of a cute black shorts & a printed top (: &&& later on at Mango I got a cute leopard prints flats at only $29! My outfit for shopping day! Anyhow, spend my evening today with Progs! We had some yummy Bak Kut Teh at Clarke Quay. I dont know why but I never really try BKT before && it was rlly so good. Shawn's party before he return back to London! 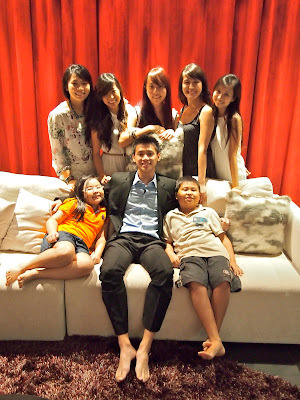 His super adorable & talkative little cousins! The result when you pass e camera to a 8 year old! 4D girls & le SHAUN WAI & debbie's bf!